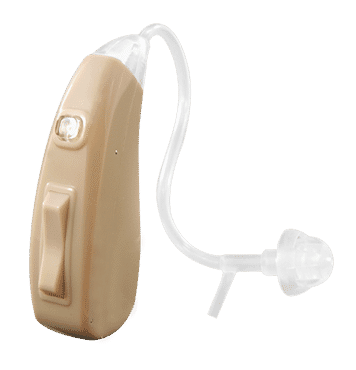 Imagine being able to experience the benefit of hearing more clearly while also enjoying the modern convenience of easy-to-use rechargeable hearing aids – all for a low affordable price. The Precise Hearing RC includes the same key elements of advanced digital hearing aid technology that more expensive hearing aids share, but adds the bonus of never having to fidget with those tiny little hearing aid batteries ever again. This eco-friendly rechargeable hearing aid provides the convenience of a simple USB recharge to bring it back to full power and it will quickly pay for itself in battery cost savings – plus it will help you hear better too! The Precise Hearing RC is designed for noticeable to significant hearing loss. It is an excellent choice if you are able to understand conversation in most situations, but just need a “boost” to fill in what you might be missing. It can also help provide a solution for those with difficulties in the higher frequency range as well. An onboard digital sound processing chip delivers crystal clear sound to the hearing aid, with less feedback than older analog technology. Other great features include a low battery warning, automatic noise reduction, volume control and a program button! By simply plugging the Precise Hearing RC device and charging cable into the USB slot on your computer or wall adapter (supplied) for 2 hours, you can expect up to 16 hours of use. When not in use, the ON/OFF button allows the unit to be completely shut down, helping to preserve the charge. Rechargeable is now affordable, convenient and easy-to-use with the Precise Hearing RC rechargeable hearing aid. Need a bit more power? If so, please add the POWER UPGRADE to your hearing aid. The power upgrade consists of an ear-hook and thicker tubing to provide you with increased sound input.